The HP Designjet 815 MFP is a large scale multi-function printer that offers not only colour printing, but scanning and copying too. This HP 815mfp is ideal for business purposes and comes complete with a job accounting function to allow for accurate client billing. Printing up to A1 format, this printer is ideal for producing signage and marketing materials on a variety of media. The HP Designjet 815MFP has an embedded HP-GL/2 processor that includes Windows and AutoCAD drivers with a 6GB hard drive and 160MB of RAM to allow for easy print job management. The large-scale design of the printer allows for a maximum scan and print width of 42 inches making it perfect for larger jobs. 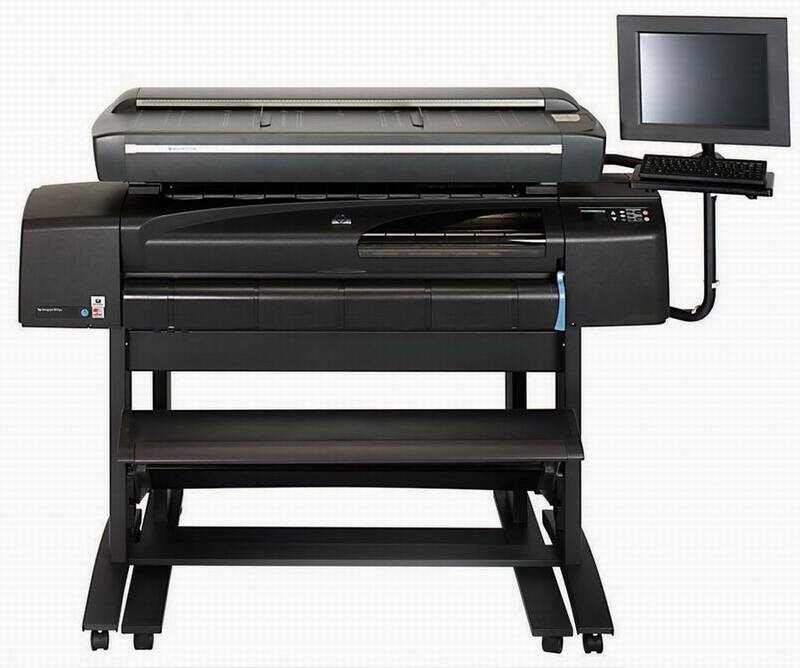 The Designjet 815mfp features a sheet feed system, a roll feed, and an automatic cutter. The printer stands 1.5m tall, 2m wide, and has a depth of 0.84m. In total, it weighs 180kg. Built-in devices on the unit include a character keyboard and a touchscreen for ease of use. The HP Designjet 815 MFP offers great flexibility and can handle a variety of file types including PDF, TIFF, JPEG and CALS G4 files, and is compatible with Mac, PC and UNIX. The HP Designjet 815MFP also has a scan to CD feature. Jobs can be completed quickly with up to 21 sq ft of printing per hour in colour best mode, and 85 sq ft an hour in draft mode. The HP Designjet 815 MFP produces high-quality prints with a maximum resolution in both colour and mono of 2400 x 1200 dpi, and can print on a variety of media including standard paper, tracing paper, glossy photo paper, vellum and vinyl. This HP Designjet 815MFP is primarily a business printer and would not be suitable for small scale printing requirements in the home. The HP Designjet 815mfp has only wired connectivity and is not suitable for an environment where Wi-Fi printing is required.